Not in Sharon! To find people on the streets, cafés and bars, shops open past 6 (shops at all) a road trip is called for - like this one, to Great Barrington, MA, 40 minutes away. You have great pictures this last one is good to sell to agencies because it looks as a teengaer walking around. for direct contact this is my email, mhols@netvisao.pt I would like to help you further over here in portugal it is all very difficult at the moment. Great shot! I like the kid out front of the record store. 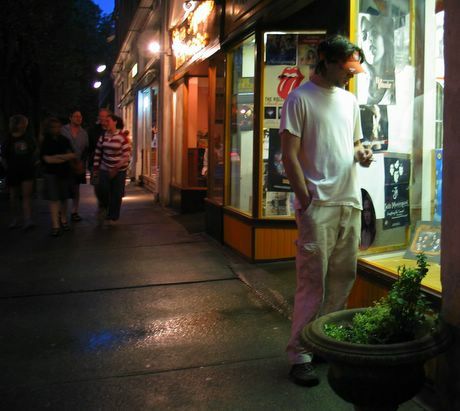 I remember spending hours in record stores like that (maybe its not a record store, but my mind thinks it is). Sigh, now Amazon.com has ruined that. BTW...your previous post had me singing the Monty python "Spam" song all day yesterday. our night life is similar ....none! So, at last a shard of light on a downside to Sharon? This is actually a "no comment" shot (not a crit), meaning that, for me, it speaks for itself and it works. I'm wondering what goes on in Little Barrington (a Portuguese gem coming: across theriver from lisbon, there is a place I know in which 2 small districts, not really villages) are separated by a narrow waterway (tributary of river) On one side stands (translat. )Little Troubles & on the other Big Troubles. True!! Now, which one would you rather live in? And not to mention Bottom of the Bathtub, which is down the road....(it IS all true). Returned to say I really like this pic. Particularly the blue reflected patch, the kind of halo of light effect with the darkness encroaching from behind. Street Photography: My favorite type of photography after landscape and nature! Very good. It's a shame the right corner is too dark. But very good! C U! it's interesting to see nite scene in a small town, it means tranquility to me. And about the word verification, even I have it on, somehow somebody managed to send 30 spams scattered in my posts over 6 months. It took me a while to find them and so turning it on is worthwhile or else they would drive you nuts.